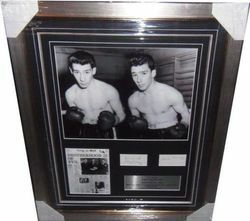 A presenttion displaying two authentic autographs of the notrious Kray twins. The signatures have been signed on stickers that were supposed to be used for an autograph book release that never materialised. The stickers were signed during the later stages of the brothers' incarceration. Professionally framed in a brushed silver gallery standard frame and mounted in a crisp black mount along with a stunning 16x12 photo of the infamous twins and a 8x6 copy of the Daily Mail's cover reporting the sentencing of the pair as well as a plate with the relevant details engraved. Overall size: 30x25 inches. This item is in good condition and also comes complete with our lifetime guarantee UACC/AFTAL Sports & Star Autographs Certificate of Authenticity.